All Saints Centre Kings Heath - A purpose-built centre in the heart of Kings Heath, attached to the historic All Saints Church and fronted by the newly developed Village Square. From our 150 sq metre brand new hall seating 200 people, to the Marjorie Allen room with beautiful stained glass windows, seating 25 people, we have the perfect venue for your needs. You can also hire the Village Square for functions. We offer catering, an entertainment licence and an alcohol licence. 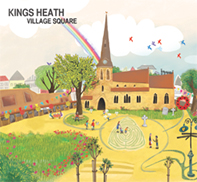 The new Kings Heath Village Square was opened in October 2011. Since then it has hosted many groups including regular markets, music and arts events, and is available for hire for any activity. The Robin Centre is a purpose built modern day centre providing care and respite for older people. There are client vacancies, and support funding may be available. All staff working within this provision are qualified social care professionals. There are also a variety of activities for adults. We offer a range of activities that are interesting, safe and fun for children of all ages. From younger children's activities such as Cubs and Scouts or Tae Kwon Do, to our fantastic Youth Project for young people of all abilities. Click an event to find out more.